Here is the verdict of the Fans Panel on FC Halifax Town’s highs and lows of the 2017-18 season. Moment of the season - Mid-December and the signing of Michael Collins. Colllins made a massive impact on the team, if he had signed last summer he’d surely would have won the player of the season. If we had 11 Michael Collins’ next season we’d win the league by Christmas. He’s a top player. Player of the season - Matty Brown. Matty has had a great season leading the team as captain. He has given 100 per cent in every game and really made a difference to our defensive record. I’m delighted he’s signed a new contract. Moan of the season - The quality of the officials has had a real impact on the enjoyment of many games this season. They all seem to think the game is about them at this level. Let’s hope many follow in the path of Ian Hussin and also get snapped up by the Premier League, they deserve our cast-offs. Hopes for next season: Jamie Fullerton has a big summer ahead of him preparing for his first full season as manager. I hope he’s given time by the fans if the season doesn’t start as well as people expect. I’d be delighted with a mid table finish and perhaps not too far below seventh place. As a part time team, avoiding relegation is still a big achievement though. Moment of the season - Watching Town play against Leighton Orient away on a Tuesday night was my highlight of the season. It was the best they’d played this season and winning 3-0 against such a big club was amazing. Player of the season - Matty Brown has been consistent all year and has supported his team mates even when things were at their worst. Moan of the season - The level of the officials has been appalling this year. Last year was not acceptable but this year has been worse. This needs looking at over the summer months. Hopes for next season - Aiming for the play-offs next year is as high as we can aim realistically. Hopefully if things don’t work the manager will change things not keep things the same and hope for the best. 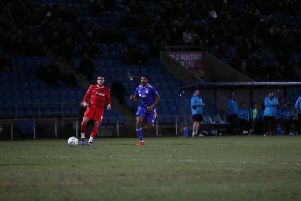 Moment of the season – The second goal at home to Bromley. Down to ten men, Town rolled their collective sleeves up. Kosylo’s determination took him half the length of the field, and when his perfect cross found Tom Denton’s head the result was inevitable. Player of the season – I agree with the Supporters Club choice, which was captain Matty Brown. His attitude is spot-on, and I’m delighted he’s signed a new contract. Moan of the season – This was the season which might have been. Billy Heath found his best team when he played Connor Oliver and Adam Morgan running off Tom Denton. Unfortunately, he then tinkered and his formations never clicked again. Hopes for next season – There wasn’t a great deal between the standard of the top 20 teams this season. Most sides seemed to be simply hard working and well organised. As long as we keep our most talented players, there’s no reason we can’t finish at or near the top next year.